Attach to an overhead cable resistance system like those found in a gym to replace the traditional knotted rope and lat bar for pull downs. The e3 Tricep/Lat Grips (TLGs) will isolate the triceps, lats, and posterior deltoid with reduced pressure in the trapezius. 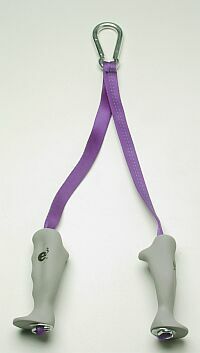 In addition to use for strength conditioning and toning, doing simple pull downs with the e3 Tricep/Lat Grips improves core stability immediately and has a carryover effect which can be utilized by runners, throwers, golfers, football players, etc for increased power, distance and speed. Take advantage of our 30 day money back guarantee and try the e3 Tricep/Lat Grips risk free for 30 days. COLOR NOTE: We normally ship e3 Tricep/Lat Grips in colors depending on stock availability. If you have an absolute preference for a grip/webbing color combination or a "please don't send green grips with blue webbing" message, please do so in one of the comment boxes on the order form when you get to the shopping cart. We can not guarantee that we will be able to fully comply with your color request, but will try to do so, or come as close as possible.